This past weekend, I attended a fantastic art workshop in Vermont taught by the artist Claire Desjardin. I have long admired her colorful, organic paintings and the loose, playful style of her work. Taking a workshop is a great way to grow as an artist. But like learning any new skill, it can also be accompanied by frustration and disappointment. The key to enjoying your workshop experience is to go in with a creative spirit. A workshop is a great place to experiment with new ideas and make new artist friends. 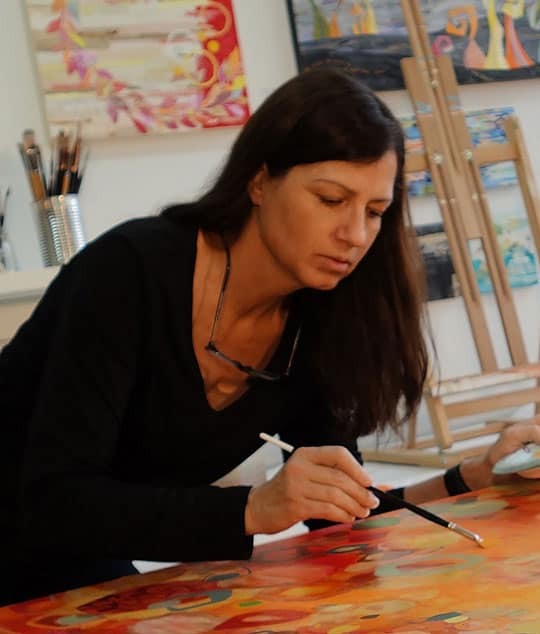 It is NOT a place where you can expect to do your best work or come home with finished masterpieces after having mastered the latest techniques. You will likely feel as if you are struggling. That’s because you are. It’s important to just dive in, take risks, and push on with this new approach. Pushing through the struggle rather than succumbing and resuming old practices that are comfortable is the whole reason that you took the workshop. Another great benefit is that you get to spend concentrated artistic time with like-minded peers. How special is it to have protected time to create; time where you are freed from the concerns of everyday living. Traveling away from home to attend a workshop gets you away from ringing phones, laundry, bill paying, and other distractions. Set aside this opportunity and protected it on your calendar. Attending a creative retreat will help to nourish and replenish your creative soul.